Maximum Merseybeat Just like it used to be! Formed in 2005 by drummer Tony, these lads authentically recreate the look and the sound of those Liverpool days and Hamburg nights, when the original Mersey Sound was born. The group’s ethos is based around the early 60s, as they believe that this is when beat music was at its most exciting so don’t expect anything past 1965! 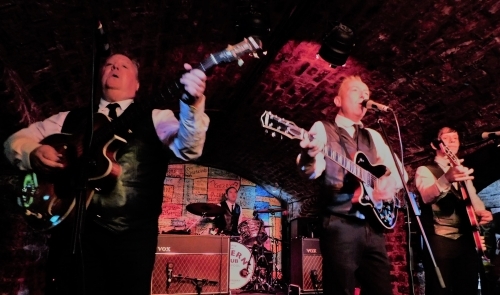 They have a twice weekly residency at the Cavern Club, Swingin’ Saturdays ‘lunchtime session’ & Shakin’ Sundays, where the boys play to a world-wide audience every week and are established favourites at the world’s most famous club. 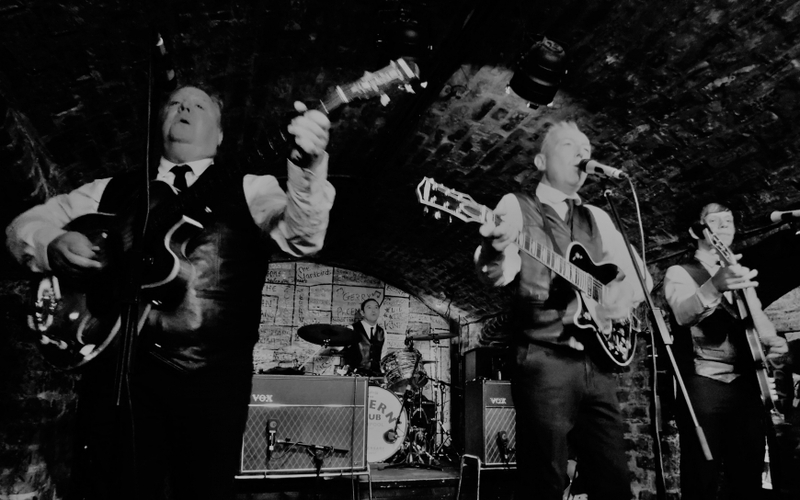 The Shakers are now fully endorsed by Germany’s Hofner Guitars, an iconic 60s brand very much associated with 60s beat and their legendary sound can be heard every week at the Cavern Club. Over the past ten years they have performed all over the UK, Europe, the Middle East and the USA. They made their debut at International Beatleweek, Liverpool in 2006 to a great reception and have played the festival every year since, as Liverpool’s beat ambassadors to the worldwide Beatle community. Successful appearances at Beatles festivals in Belgium, Switzerland and Italy (including a follow-up appearance at Teatro Adriano in Rome where The Beatles also debuted in the city in 1965) Ostend’s Paulusfeesten festival plus headline club gigs in Bahrain, Belgium, Germany, Spain and Jersey have solidified their reputation for the best in beat. They also have many 60s weekends to their credit, a UK theatre show tour and have backed many 60s artists, such as rock’n roll legends, Tommy Roe and Chris Montez, ‘Merseybeat’ alumni, Beryl Marsden, The Mojos’ Nick Crouch, the late Undertakers frontman, Geoff Nugent, Kingsize Taylor and Lee Curtis. Plus, at the huge ‘Lennon Remembered’ gig at Liverpool’s Echo Arena, the late Hamburg legend, Tony Sheridan. Mach Schau indeed! Their CD EP’s, ‘CAVERN STOMPIN’ & ‘MACH SCHAU!’ have sold well (now sold out!) globally and recently attained the top twenty on a number of radio stations in the USA. With a full-length vinyl LP ’A WHOLE LOTTA SHAKERS!’ now available and selling well on Germany’s Soundflat Records, there’s definitely a whole lotta Shakin’ going on! In the meantime, they continue to keep it beat and are in demand to represent Liverpool and its beat heritage on the worldwide stage. 2013 saw them make a dynamic debut at the ‘Abbey Road On The River’ Beatles festival in Kentucky, USA and they appeared at many more overseas events during 2014. 2015 is their tenth anniversary and is already shaping up to be one of their busiest years yet, with appearances all over the UK at the top three 60s festivals in the country plus their ongoing residency at the most famous club in the world. So, ‘with the hi-fi high and the lights down low’, get ready to twist ‘n’ shout with The Shakers –‘The best Merseybeat group to come out of Liverpool since the 60s!’ – THE BEAT magazine.